Chris of "Chris Beat Cancer" recovering from cancer surgery. Look out, Chris! Your mustache is melting! Here Chris "beat cancer" Wark has "inspired" Debbi not to believe her surgeon. "Gave me the strength to turn down chemo!". Whether this is a genuine or fake review for Chris's book, it's horrific either way. Chris Beat Cancer is a popular anti-chemotherapy website created by Chris Wark, who claims he cured his bowel cancer by adopting a "raw vegan diet". By his own admission, Chris Wark had surgery to remove the cancer from his abdomen. According to Professor David Gorski MD PhD (a surgical oncologist who was not involved in Chris's case), that surgery alone (without chemotherapy) had a ~60% chance of curing Chris's stage-III bowel cancer, and that probability would have increased to ~75% had Chris also received adjuvant chemotherapy, which Chris refused. Long-term large-population studies have been done to determine the impact of going veggie after a cancer diagnosis, e.g. WHEL. The Chris Beat Cancer website promotes a panoply of quackery, for which Chris is paid commission. As an example of the measly income he receives from his website, Chris states he earns "8 cents" for posting a link to a product on Amazon. However Chris's income from other links on his website is over 1000 times higher: a reader clicking on a link to Ty Bollinger's "TTAC" (The Truth About Cancer) products can earn Chris over $100. Chris promotes other pusher$ of cancer quackery, such as Cancer Tutor, Cancer Control Society, Dr Veronique Desaulniers, American Anti-Cancer Institute, CancerCrackdown, "Best Answer For Cancer", CANCERactive, "Yes To Life", "HealingStrong™", Dr. Keith Scott-Mumby, Mike Adams, and Ty Bollinger. Chris repeats the conspiracy theory that cures for cancer are being suppressed, e.g. amygdalin, found in apricot kernels, ("suppressed", despite the fact apricots are readily available). "Cancer Mastermind" Chris has compiled his accumulated wisdom into an own-brand "healing cancer coaching program", which only costs $297 $197. For some of those who follow Chris's advice and eschew chemotherapy, it will cost them more than money. Initially Chris offered a 100% refund to dissatisfied customers, valid for 1 year; however, for some reason, he has reduced the refund period from 1 year to 6 months. In Chris's coaching program he recommends: Essiac tea, "Dr. Hulda Clark’s parasite cleanse formula", colloidal silver, "black-seed expert, Dr. Roby Mitchell", Dr. Nicholas Gonzalez's enzyme-therapy, "The Navarro Urine Test", Dr Richard Schulze's "herbal detoxification program", Gerson therapy, Alkaline diet, and Sir Jason Winters anti-cancer tea. On 25th September 2018 Chris Wark released a book entitled "Chris Beat Cancer: A Comprehensive Plan for Healing Naturally". Within ten days it had garnered over 200 five-star Amazon customer-reviews, but according to "fakespot.com" most of those reviews are bogus. 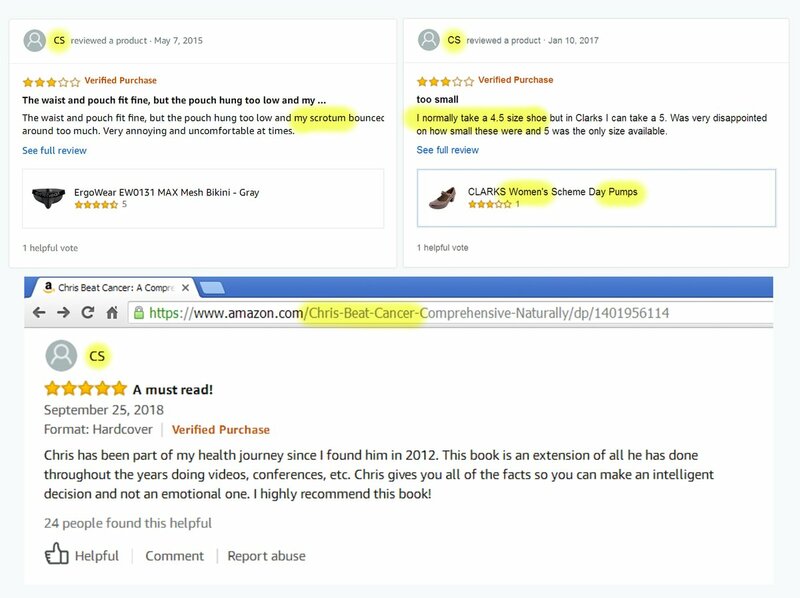 NB: fakespot's AI would not recognize that reviews by struck-off doctors, naturopathic doctors, & "dear friends" of the author, are unreliable. Chris Beat Cancer is a Limited Liability Company, registered in Nevada, despite Chris being in Tennessee. (Incorporating a company "out-of-state" in Nevada is an attempt at tax-avoidance and asset protection ). Chris lies about his testimonials - when people he interviews die of cancer he deletes the evidence from his channel and website. Shill for Promote Chris's "Square One" cancer-coaching-program and get up to 50% commission. Chris says his "integrative onclogist" was the late Dr Roy Page, who lost his medical-licence in 2008. Chris demonstrates his scientific-competence by promoting Earthing here, and Solfeggio-frequencies here. Chris Wark's top-secret briefing for those newly diagnosed with cancer: "Everything I've told you, just keep it to yourself". On page 17 that top-secret briefing, Chris recommends a bogus blood-test called "the Greek test", a.k.a. "the RGCC test". YouTube video of Chris recommending the RCGG RGCC/Greek blood-test be done repeatedly, (at $2K-$3K a pop). e.g. chiropractor "Dr.V" has offered ONCOblot® & RGCC "Greece test", ( "Dr.V" also sells amulets to protect customers from invisible evil-forces ). Chris has recommended the "American Metabolic Laboratories" cancer profile blood-test. The inventor of that test, Dr Emil K. Schandl, has been disciplined by the Florida Department of Health, and sentenced to 4 years in jail for tax evasion.That "Dr. Schandl is a frequent speaker at the Cancer Control Society". Stephen Barrett's article about the Chris Wark story. David Gorski's article about the "Chris Beat Cancer" website. A very detailed examination of Chris Wark's claims. Chris Wark's fame is antipodal. An unlisted YouTube video promoting Chris's "Square One" "cancer coaching program". Chris Wark's appearances on "The Truth About Cancer" YouTube channel, (a Ty Bollinger production). ChrisBeatCancer promotes "TheTruthAboutVaccines": an anti-vaccination "documentary", (despite the fact some vaccinations prevent cancer). Unsurprisingly, given his bible-bashing, Chris states that "The human body isIntelligently Designed". When not helping people get rid of cancer, Chris is helping them get rid of cockroaches. ↑ Chris does bang on about God, e.g. in writing here, here & here, and on video here, here, & here. ↑ March 2017, "Hypestat.com" states "ChrisBeatCancer.com" gets 279,000 views per month. ↑ Chris Wark's URL "CureCancerWithoutChemo.com" redirects to "ChrisBeatCancer.com". ↑ Archived copy of http://www.chrisbeatcancer.com/cancer-surgery-2003/. ↑ Conclusion of WHEL study. ↑ The affiliate disclaimer page on the ChrisBeatCancer website: a legally-required acknowledgement that he's being paid to promote. ↑ Chris's example of his website earnings is "8 cents". ↑ Chris Wark promotes chiropractor "Dr V" Desaulniers. ↑ Chris Wark states he donates %age of proceeds to CancerCrackdown.org, who in-turn promote him as a "hero". ↑ Chris Wark promotes "Best Answer for Cancer Foundation" (BAFC). ↑ A Google-search showing some of the doctors on the BAFC board listed on casewatch.org. ↑ The first character after their name is false information: "HealingStrong" is not a TradeMark. ↑ Chris says Mike Adams is a "genius". ↑ Chris poses with a bag of apricot kernels, which release cyanide when eaten. ↑ Chris Wark owns the URL "HealingCancerMastermind.com"
↑ Chris's "1 Year 100% Money-Back Guarantee"
↑ Chris's 1 year refund halved to "6 Month Money Back Guarantee"
↑ Evidently survival with Gonzalez-enzyme-therapy is poorer than no treatment. ↑ Professor David Gorski says the Navarro cancer test is "bogus". ↑ Chris promotes a Gerson clinic for free, honest. ↑ Chris describes his raw vegan diet as "alkaline". ↑ Click here to see a free PDF of Chris's book from his website. ↑ This review of Chris's book is apparently by transvestite-man with size 4½ feet. ↑ A five-star review of Chris's book by Robyn Openshaw, who is described on p286 of the book as a "dear friend" of the author. ↑ http://NVsos.gov/sosEntitySearch for "Chris Beat Cancer LLC" in 2017. ↑ Cherrypicking Chris discards any that turn-out to be rotten. This page was last modified on 5 April 2019, at 10:21.